A creative vocabulary builder software for SAT, TOEFL, GRE, GMAT and general vocabulary, Build your vocabulary in a fun unique way ! 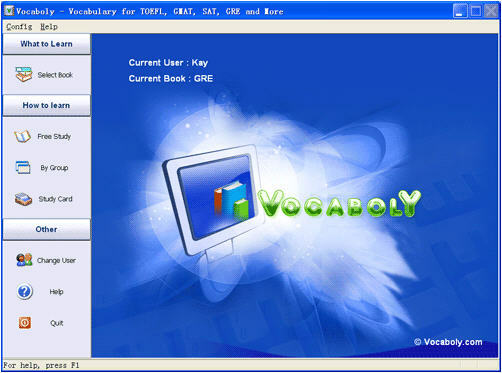 Vocaboly is a creative vocabulary builder software for SAT, TOEFL, GRE, GMAT and general vocabulary. Vocaboly contains five books: SAT, TOEFL, GRE, GMAT and VOA Special English, with more than 12,000 words, each word provided with meaning, phonetic symbol and pronunciation. Vocaboly contains five books: "VOA Special English", "TOEFL", "GMAT", "SAT" and "GRE", with more than 12,000 words, each word contains meaning, phonetic symbol and pronounciation(decent American accent). You can select a book according to your purpose and English level. Every book contains eight flash cards, after you put some words into these cards, you can select a card to study, like that you can easily focus on the words you want to learn. Each word can be assigned to a difficulty level from 0 to 5, the default difficulty level is 0. You can learn the words in whatever difficulty level you choose. Combined with word cards, you can easily pick up the words that you are unfamiliar with. Each user has his own study record and software setting which is saved automatically when you quit the program. Study Word Ticker Display words automatically. Spelling Spell words by meaning. Test Listening Spell words according to pronunciation. Multi-Choice Select correct meaning or word from four choices, the test is generated dynamically, so each test is unique. Game Memory Match the word and meaning. Star War A shoot game.